This week was a bit tough, I was a little tired and jet-lagged after my quick trip to Toronto for 2XU Camp, which you can read about here: PT 2 of 2XU Camp: Training like an Elite Athlete.. It is also challenging to be running in the dark every night, except for weekends, sun where you at? At least the rain hasn’t been too bad, only 1 super rainy run so far! This will be my last week of 5 running days for a while I believe, because this week I am back up to 6. It’ll feel good to have higher mileage again! Tuesday: 50 minutes easy, this was a commute home from work run and then I did the NTC Ab Burner 2.0 workout. Wednesday: Group workout at The PISE track, I love the track! Our workout was: 20 minutes easy, 3 sets of: 600m @10km pace, 200m @5km pace, 100m sprint, 20 minutes easy. It wasn’t meant to be a super challenging workout, and the focus was running form, which was recorded and later reviewed. Thursday: 70 minutes easy, this was the first unenjoyable run I have had in a very, very long time! It was dark and rainy and I felt like a slug! But I still did it and that’s all that matters. 50hr work week, you won this time! Friday: OFF, I did do The NTC Core Countdown Workout, this is a good one! It tells you how many reps to do, so it takes as long as you take to complete each exercise. Saturday: Group workout at Mt Doug, the plan was hill repeats. 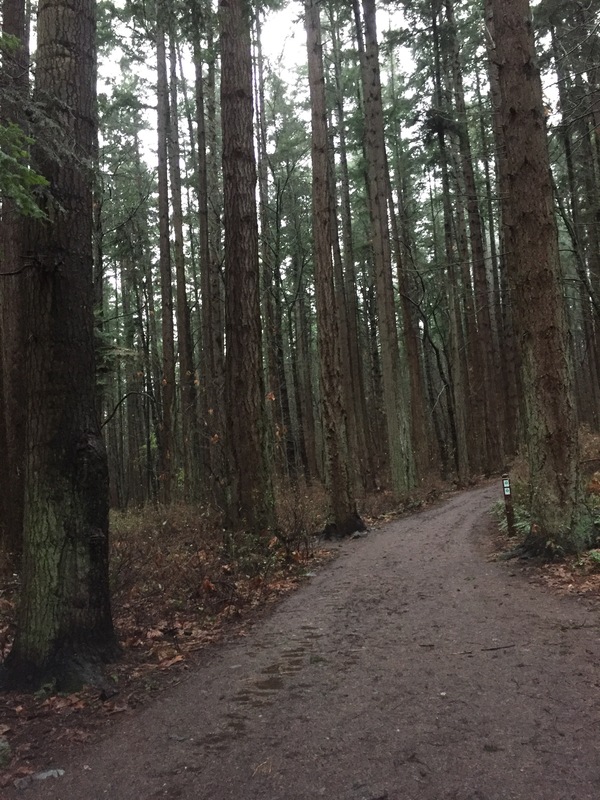 It was raining a bit and SUPER muddy on our hill, but Mt Doug is a very beautiful park to run in. We did our regular 20 minute warm-up and 4 hill repeats, which were tough work but felt really good after we had completed it and then a 20 minute cool-down. I also did a 45 minute strength workout, I used some weights, resistance bands, and did some body-weight exercises too-those darn planks, ya know? I finished it with a NTC core workout. Sunday: Long Run Day, I am happy to actually be doing long-ish runs again. This was 18km and I took the Galloping Goose Trail down to Vic West and then ended up at Dallas Rd. It was a great run where I didn’t notice the time nor mileage and just enjoyed being out running and daydreaming. The best kind of run there is! Sounds like you’re taking great advantage of all the beautiful spots to run in Victoria! I always like when we do hill repeats at Queen Elizabeth Park because of the views. The dark and rain have been squashing my motivation! I am pretty sick of running in the rain, hail and wind. But hopefully this is the worst of it! I don’t seem to remember training in January and February being that bad last year.